Little Rock Police are offering a reward of $20,000 for information leading to the arrest of the driver who they say killed a three-year-old boy in a road rage-related incident. 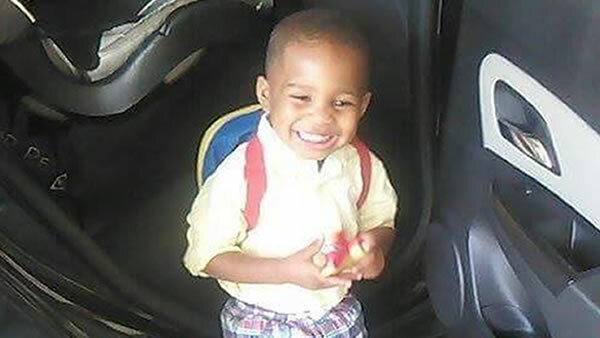 LITTLE ROCK, Arkansas -- Little Rock police are offering a reward of $20,000 for information leading to the arrest and conviction of the driver who they say killed a three-year-old boy in a road rage-related incident. According to the Little Rock Police Department, the boy's grandmother had been taking him and his sibling, an infant, on a shopping trip at the time of the alleged attack Saturday evening. Lt. Steven McClanahan told ABC News that the grandmother stopped at an intersection in Little Rock. The suspect, who is described by police as a tall black man, pulled up behind the woman's car in a black Chevy Impala, and honked his horn. The grandmother honked back, and the suspect stepped out of the Impala and fired shots, McClanahan said. The boy was struck by gunfire at least once, but the grandmother and the infant were not hit. The grandmother pulled into a nearby shopping center parking lot where she called the police. The boy was later transported to Arkansas Children's Hospital where he died. "Tonight's homicide was a road rage incident," police said in a tweet, adding that "the grandma and three-year-old victim are innocent and have no relationship with the suspect." The gunman fled the scene and remains at large, according to Little Rock Police. The shooting is the latest in a number of high-profile road-rage incidents recently. Last week, a jury found Cardell Hayes guilty of manslaughter in New Orleans for fatally shooting former New Orleans Saints star Will Smith in an alleged road rage incident. Smith, 34, was found dead in his Mercedes SUV with the driver's door open, slumped over the driver's seat, according to The Associated Press. Earlier this month, another former NFL player, New York Jets running back Joe McKnight, was also shot to death in an apparent road rage incident. Last month in Little Rock, another toddler, a 2-year-old girl, was killed when a car drove by and someone fired into her vehicle, but the shooter was never captured, according to the AP. Police Chief Kenton Buckner described the two road rage killings as being frustrating for the police department and the community, especially because the young victims were "very innocent" and "can do very little to protect themselves." Buckner told the press that he didn't know if the shooting of the girl and last night's shooting were related, but McClanahan told ABC News that he didn't believe the death of the two-year-old to be related to road rage. ABC News' Devin Villacis and the Associated Press contributed to this report.